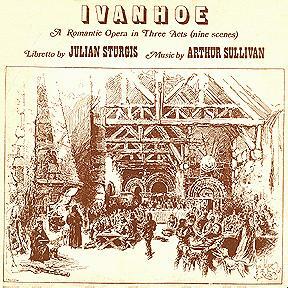 For many years, this was the only Ivanhoe recording available, but today it must be regarded as a mere curiosity. As Phil Sternenberg observed, "it [sounds] as if someone recorded it by hiding a Walkman in his coat pocket while he was watching a performance." If it sounds "like someone had a walkman in his pocket while watching a performance," this is probably because that, or something similar, is exactly what must have happened. I was the 25-year-old chorusmaster for this production, which played for three performances in Hurlingham School Hall in London in 1972 or '73. Beaufort Opera was a company which combined professional or semi-pro soloists with students or amateurs of a high standard for small roles and chorus, and attracted a certain amount of attention with productions of deserving but neglected repertoire. Several of its productions, including this one, were recorded for subsequent broadcasting (but not for commercial sale) by BBC Radio London. A year or so later, one of the members of the cast confronted Joseph Vandernoot, the founder/conductor of the organisation, brandishing a copy of the record which he'd just found in his public library and demanding to know what the hell he thought he was doing, allowing the recording to be sold without informing or paying the participants. That was the first that Joe Vandernoot had heard of any recording being on sale. As the BBC assured us that they had not resold their recording to anyone, there were only two possibilities; either someone had copied and pirated the BBC broadcast, or had smuggled portable equipment into the hall, and from what I have read, the recording is certainly not of BBC quality. Joe contacted the head/owner of Rare Recorded Editions (whose name I forget), who was totally unapologetic. No, he wouldn't say how he'd obtained the recording, no, he wasn't proposing to pay us for the privilege because he hadn't made enough on it, go ahead and sue if you want but given the company's finances you won't get enough out of us to pay the legal fees, and anyway, you should all be grateful for the free publicity I've given you. So there the matter rested. I've never heard the recording myself, but it might bring back a few memories. I have it on cassette, and it's awful. Someone in the audience is taping it, and he obviously has a cold. In some places, he can't sit still, so the tape recorder is scratching against something, like the inside of his coat. And you can hear somebody whispering to somebody else at one point. However, what it lacks in taping quality, it makes up for in energy. One or two voices (and the orchestra) may be ragged, but the singers are giving it their best — not like the Prince Consort soloists, who seem to be annoyed to be in front of a microphone, tired, and unsure of their command of the English language. The duet between Rebecca and Brian is shortened, as is Act III, scene 2, when Richard pardons Maurice de Bracy, apparently reflecting alterations Sullivan made for the Berlin première. The march preceding Brian and Maurice's first entrance is also shortened. BTW, the duet between Rebecca and Brian is truly a fine piece of music writing, and in the hands of a good director could be quite dramatically powerful. It took me a while (forgive me my stupidity) to realize that Brian doesn't want to marry Rebecca, but wants to set her up as his mistress — I'm not sure if the arrangement is to be made public. "Chastity" is not the same thing as "Celibacy" — and Rebecca reminds him that his vow is of "poverty and chastity." Perhaps her anger is aimed at Brian for seeking riches and power as well as for keeping her as a mistress? Any thoughts? My favorite musical moment in Ivanhoe is the templars' chorus "Fremuere principes." The tympani roll in the 2nd verse before "Nobis sit victoria" sends chills down my spine. Except for a few off notes and the fact that the female voices have barely any diction, it is an acceptable version of the Opera. The sound actually is very good for a "pirate," and there is not too much audience noise — certainly not enough to be distracting. I don't believe it was ever in stereo; certainly my original copy was mono. The biggest problem with the set is that it came with no libretto. Before the advent of the internet, it was impossible to ever know what was going on. You could follow the action when the males were singing, but as soon as a female began, that became impossible. Your interest quickly began to flag as your mind began to wander. Recently I transferred the set to CD myself, and with a little "de-popping" the sound is very good. I was also able to download the libretto from your site, and along with separating the sides into separate tracks I know know better what the opera is about. The 1982 issue on Legends is apparently a "pirate" of the original performance. According to J. Donald Smith, one of the stereo tracks is defective, but "if one shuts off the offending channel, it is listenable." I am told that this recording was broadcast on the BBC in about 1972, before the record came out, and some listeners may have copies taken off the air.